I have a license to operate all HF bands, but my Hustler 4BTV 4-band trap vertical only covered 40 m, 20 m, 15 m and 10 m. Now the 80 m band is the only band which allows me to work NVIS night and day across the region here, while 17 m is a real good alternative for the overcrowded 20 m band. So sometime ago I decided I need to invest in new antenna. One with which I could also operate on 80 m and 17 m band. But what type of antenna should I choose that also offers these bands and does not take too much space? The Hustler’s SWR has always been a challenge, at least to get it reasonably OK on all bands. For some unknown reason it has always been difficult to get the traps tuned to an acceptable SWR, especially on 10 m and 15 m. Past year, also 20 m SWR started to drift, leaving only 40 m OK. Well, after 7 years on the roof in our windy and rainy climate, corrosion had taken the best from this antenna. It is clear that rain and wind are definitely not good for an antenna with traps. So I decided not to buy a trap vertical again this time. The Hustler 4BTV at my home QTH. If you look for a commercial multi band HF antenna that covers quite a lot of bands, the price is really a thing. Mostly over € 500 ($ 600). Constructing the antenna myself would be the best option. But I am not an electrical guy, but more a mechanical one. Now I once read about remote auto tuners and using these with a piece of wire or aluminum tube. Many users of these auto tuners were quite satisfied. Well, placing the tuner directly at the base of the antenna is the best way of tuning any piece of conducting material. So why not build a vertical antenna myself and tune it with a remote auto tuner? I had some aluminum tubes left from earlier projects, so no need to buy new material for the new vertical. But how to determine the optimum length to have it work as efficiently as possible on all HF bands. In several articles on the internet, I read that 13 m (4 3ft) gives quite good results. Now that is a bit too tall for my location. About 10 m (33 ft) length would be the maximum for my location. Now which remote automatic tuner should I choose? The CG-3000 (which looks like a copy of the SG-230) from CG Antenna. The MFJ-926B from MFJ Products. All three can handle the 200 W PEP from my Kenwood TS-480HX. There are some interesting reviews on these three types. A review from AD5X gave me the best insights. The SG-230 is the best out of three, but twice as expensive than the other two. The SG-230 tunes a 13 m (43 ft) vertical easily on 160 m, while the other two don’t. But based on the price and the fact that 160 m was actually not on my wish list, I decided to go for the no.2, the CG-3000. GB Antennes here in The Netherlands had a really good deal (February 2015) on this tuner for just € 239,00 including VAT, so I ordered one. I spend an afternoon assembling a 9 m vertical. It’s made from 6 sections of aluminum tubing from 30 mm (1.3/16″) at the base to 10 mm (15/64″) at the middle. For the top section, which endures quiet some mechnical stress, I used two sections of carbon fibre tube, 8 mm (5/16″) and 6 mm (1/4″). From the aluminum section a copper wire runs up along the carbon fibre sections. To show my kids that you can actually transmit with 5 cents, I soldered a 5 eurocent coin to the end of that wire, hi! On the 6 m (20 ft) high roof I have placed a homemade steel 120 cm (48″) x 60 cm (24″) flat mounting frame which is stabilized with concrete pavers. I put the vertical on top of a 2 m steel pipe which is bolted onto the frame. The CG-3000 tuner is mounted on top of the main steel pipe. 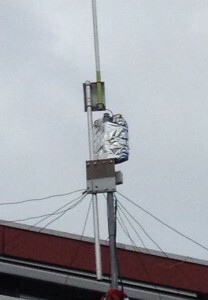 The antenna is mounted with a side mount to a secondary short lengthy of aluminum tube. This secondary aluminum tube is mounted with a side mount tot the main steel pipe. This way I can lower the antenna just by disconnecting it from the tuner. I do not have to dismount the tuner with it’s coax cable and radials attached. My remote controlled Kenwood TS-480HX transceiver is mounted in the attic, close to all my antennas. So the feed line to the vertical is only 6 m (20 ft) long. I use MIL-C-17/74C spec RG-213. Near the the tuner I use a 1:1 current balun, made from 12 turns of RG-58 around an Amidon FT240-43 ferrite core. Three 15 m (50 ft) length radials. Four 6.7 m (22 ft) length radials. Four 2.7 m (9 ft) length radials. I connected these fourteen radials all together to a 5 cm (2″) long wire which is connected to the CG-3000’s ground terminal. That makes it very ease to disconnect all radials at once from the tuner’s ground terminal. The radials are sloping between roughly 20° and 70°. A 6 mm² (#10 AWG) copper wire runs down to a section of aluminum balcony railing, adding some extra counterpoise. The tuner has a plastic black case, which feels a little fragile. In the summer time it would probably get cooked in the sun, so I wrapped the CG-3000 in a few layers of aluminum foil to prevent it from heating up. But I also read that mounting it onto a sheet of metal, improves tuning efficiency. Something you will read more about in this article. It should also tune on 6 m according to the specs, but the CG-3000 could not find a match. Probably because the antenna is almost 1.3/4 wavelengths long on this band. But what I did not expect, is that it also tuned on 160 m. It took the tuner about 4 seconds to find a match, but it found one! 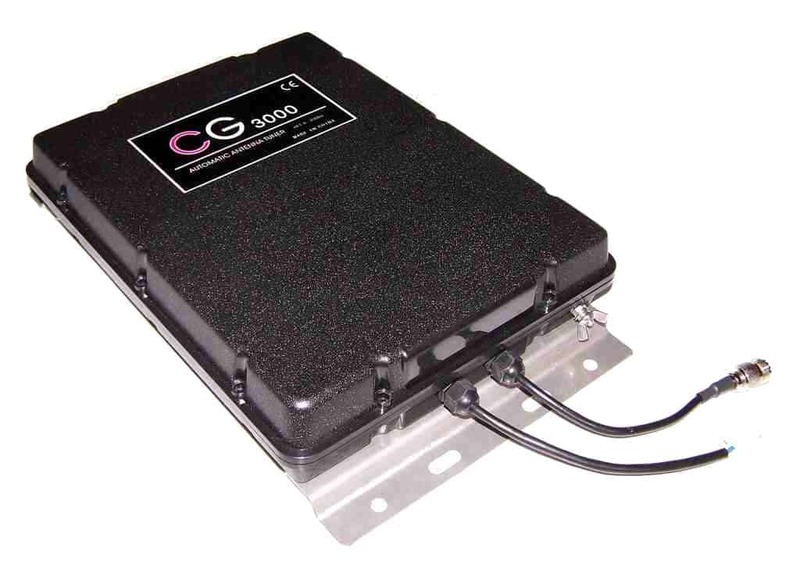 Now I earlier mentioned that shielding the CG-3000 improves tuning efficiency. Well that is really a fact, but not on all bands. Here is the SWR when I removed the aluminum foil wrapping. It looks the shielding has positive effect on most bands except for 17 m and 20 m. But SWR at 1.7:1 is still very acceptable for these two bands. This is something interesting that I discovered by accident. Just 3 m (10 ft) from the vertical I have a 10 m Moxon at 13m height. In the past year the resonant frequency of the Moxon slowly shifted from 28.5 MHz to 29.1 MHz, with SWR dropping from 1.1:1 to 1.8:1 on the resonant frequency. I could not find a direct cause. No metal objects installed recently near the Moxon that could influence it’s resonance frequency, no corrosion or other causes. The only thing that had very slowly changed near the Moxon was the SWR on the Hustler 4BTV trap vertical. But I did not expect that this would have such an influence on the Moxon’s behavior. 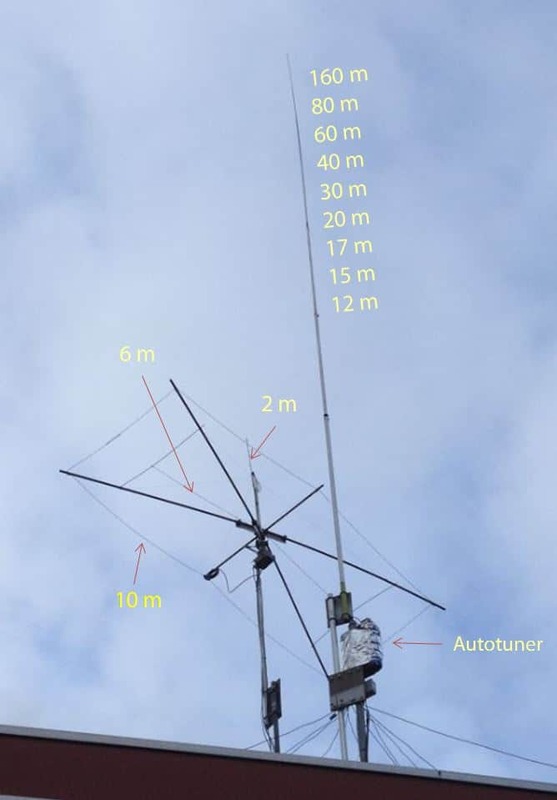 So when I removed the corroded Hustler and replaced it with the 9.4 m vertical and CG-3000 tuner, the Moxon was back at its original SWR and band center. Remarkable that a badly tuned antenna can influence the characteristics of another antenna nearby. The WSPR mode is probably the ideal mode to test an antenna. So next months I will be testing the new vertical with the CG-3000 remote auto tuner on alls bands from 160 m to 12 m. So stay tuned for my next blog entry.